Whoop! Book should be rolling off the press any day now. Here’s the schedule of launches and readings. Note: The book does not contain any photos. However, at all the readings I’ll be giving a short slide show with an overview of the 31 days, along with reading some excerpts from the book. Would love to see you at one of these events! Thursday March 15: Clare, Le Trécarré (art gallery) at Rendezvou de la Baie, at 7 p.m.
Sunday March 18: Shelburne Library 2 p.m.
Thursday March 22: Pubnico, le Musée 6:30 p.m.
Saturday March 24: Yarmouth Co. Museum & Archvies, 2 p.m.
Wednesday June 13 Weymouth Library, 6:30 p.m.
NB and ON dates TBA. Kudos and congratulations! What a remarkable journey this books represents. I can’t wait to read it. Why not do a reading in Tusket as well? Since it’s part of your back yard and all? Maybe at the archives or courthouse here (there’s a gift shop in the courthouse too) or at Ecole PEB? So excited for you!!! Hugs. Great idea! Will line something up at the Courthouse this summer. Appreciate you popping into view! 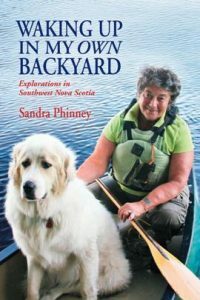 Congrats on the new book Sandra!!! Can’t wait to get my hands on a copy! I don’t see any readings in the Halifax area on your list, hopefully you’ll be adding us to your tour soon. Great to see you pop into view Catherine! Book is available in most Chapter books stores! Also can be ordered on line from them. Hope you enjoy it!